MAKE YOUR OWN HAVAIANAS 2016 IS TURNING JAPANESE! To make your own Havaianas in Davao, check out MYOH at the 2nd level of SM Lanang Premier (beside Starbucks) from April 22 to May 1, 2016. There are many things to look forward to in April. Sure, it may be one of the hottest months of the year but it is when summer activities are in full swing. In Japan, cherry blossoms are in bloom, and this year, it is when the biggest flip-flops customization event in the country, Make Your Own Havaianas, will happen. 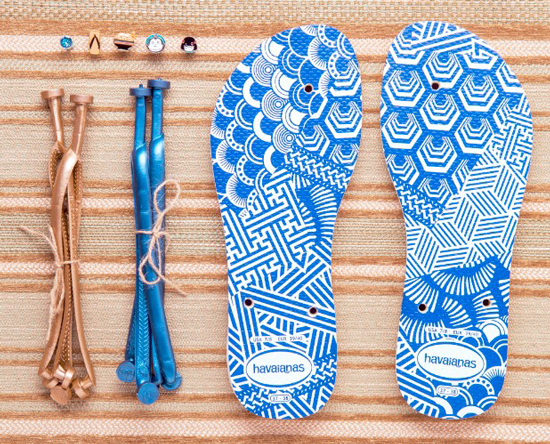 This year’s Make Your Own Havaianas goes back to its roots. We all know that our favorite flip flop brand was born in Brazil in 1962 but what most people do not know is that the very first flip flop was inspired by the Zori – flat, thonged Japanese Sandals made of fabric straps and rice straw soles. Havaianas flip-flops as we know now still show marks of these iconic rice patterns!—which truly makes it a child of eastern Zen and western joy. Now on its 11th year, MYOH goes Japanese with an experience that will take Havaianaticos to the land of the rising sun as they customize their own flip-flops by mixing and matching colorful soles, straps and pins. To make your own Havaianas in Davao, check out MYOH at the 2nd level of SM Lanang Premier (beside Starbucks) from April 22 to May 1. Here is a first look at this year's Shibori-inspired limited edition commemorative pair available in top and slim soles. Shibori is a Japanese-inspired fabric-dyeing technique. The design goes perfectly with a selection of kawaii pins - zori, empress, ramen and more! To further add more “cool” to the summer season, we at Havaianas are thrilled to announce our partnership with Starbucks SM Lanang Premier. For every purchase of any of the Starbucks 2016 Summer drinks, customers will be given a voucher which will entitle them to a FREE Limited Edition pin as they customize their pair during MYOH. Havaianaticos can also get a chance to Make their Own Starbucks beverage! For every purchase of the Havaianas Commemorative Shibori sole at MYOH, customers are given a “Make Your Own Frappucino” voucher which will allow them to two (2) free add-ons of their choice on their drink. This promo will run from APRIL 22 to MAY 1, 2016 only. Don’t miss out out as we celebrate Japan with Havaianas this year. Only at SM Lanang Premiere. For more details, check out Havaianas Philippines on Facebook and @Havaianasphils on Instagram and Twitter. Use the hashtag #MYOH2016 to join the fun!